You are studying or have studied chemistry. You know that 3D molecular structures of chemicals are important to conceptualise many problems in chemistry. To find and visualise the 3D structure of a molecule, you had to put efforts and time to surf the internet. Good News is that QR Chem has been developed by students and Professor Neil Garg at University of California, Los Angeles (UCLA). QR Chem is an online tool. 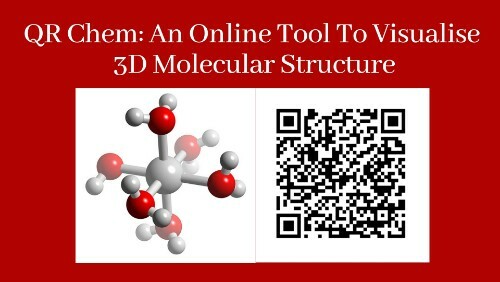 It provides QR Codes that link to the 3D image of a molecule. You can use these QR Codes in lecture slides. Or you can also print them in textbooks and homework. Hence, it will help students visualise 3D molecular structures by simply scanning a QR Code. Johnny Dang (a molecular, cell, and developmental biology graduate) came up with the idea of QR Chem. QR Codes are convenient to use and a lot of authors use them to engage students. They are be very useful in fast-paced lessons than molecular toolkits. “Molecular models can be expensive and time consuming to build. This is true specially for complex molecules. QR Codes provide much easier access and serve the same purpose. ”— Rishabh Shah, a contributor to QR Chem. The 3D molecules are derived from the database— 3Dmol.js. During the testing of QR Chem in an organic chemistry class, everyone was excited about how fast it works. A majority of students said that it helped them understand the lesson. You can download the QR Code by clicking Download option. A unique QR Code is made on-the-spot every time a user enters a molecule. This helps increase efficiency of the website and enhance its ability to handle multiple students using the website during a class. Education is not the only application that QR Chem has. It will also be useful towards chemical research and development.